Im Verlauf des heutigen Abends wurde der neue Patch mit dem Mönch als spielbaren Helden auf die amerikanischen Liveserver von Heroes of the Storm aufgespielt, der morgen früh dann auch für die europäische Region erscheinen sollte. 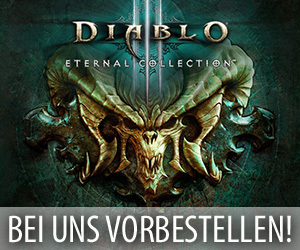 Passend zu diesem neuen Update haben die Entwickler heute nun auch offizielle englische Patchnotes veröffentlicht, die neben den durchgeführten Anpassungen auch eine Reihe von Erklärungen der Mitarbeiter von Blizzard auflisten. The Eternal Conflict between the Burning Hells and the High Heavens continues in the Nexus, and we’ve just unleashed our latest Heroes of the Storm patch! Today’s update includes a brand new Hero, the addition of Dynamic Bundles to the Shop, Ranked Play changes, design and balance tweaks, as well as a new Battleground coming next week. Complete patch notes from today’s patch can be found below. Additionally, Game Designer Matt Cooper stepped in to provide some additional insight from the design team about many of the changes found in today’s update. Read through his comments in the Design, Battlegrounds, Talents, and Heroes sections of the patch notes if you’d like to learn more about why we made each of these changes. Diablo III and Diablo III: Reaper of Souls players who log in to Heroes during the three weeks following the release of today’s patch will permanently receive Diablo in Heroes of the Storm. Any player who manages to rid the Nexus of 50 pesky Treasure Goblins during the Eternal Conflict event will receive a special portrait reward for their heroism! Kharazim has been added to Heroes of the Storm and is now available for play! Read on for a brief overview of this new Support Hero’s Abilities. Learn Transcendence, Iron Fists, or Insight using the Talents panel to select your Trait. Several Heroes and Skins in the Shop have received additional visual polish. Ancients rejoice! Sonya has received a dance animation. The Demonic Tyrael Skin has returned to the Nexus! After visiting the top smith that the Burning Hells have to offer, Demonic Tyrael has strapped into an intimidating new set of armor, imbued El’Druin with corruption, sprouted two wicked pairs of horns, and donned a crown worthy of his title as the Lord of Pride. Demonic Tyrael now also features updated Ability art, which much more closely matches his theme. Blood Elf Tyrande has also returned to the Nexus, and now sports updated Ability art, which much more closely matches her theme. War World Sgt. Hammer has received updated Ability art for Napalm Strike, which more closely matches her theme. Dynamic Bundles have arrived to the Heroes of the Storm in-game Shop! Learn more about Dynamic Bundles by reading the User Interface section of the patch notes. The Nexus Bundle will be removed from the Shop one week following patch day, but will remain purchasable as a Dynamic Bundle until that time. 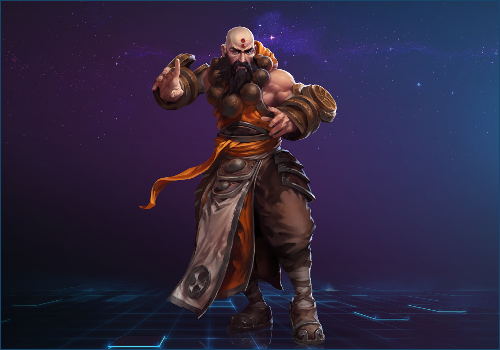 Kharazim has been added to the in-game Shop! The Nazeebra Mount, which is exclusive to the Nexus Bundle, will be removed from the Shop one week following patch day. During that time, players will still be able to purchase the Nexus Bundle to obtain the Nazeebra Mount. Brightwing’s prices have been reduced to 7,000 Gold and $8.49 USD. Additional new music tracks have been added for the Infernal Shrines Battleground. Tyrael’s Sanctification and Judgment Heroic Abilities have received updated sound effects. Bundles that contain three or more items are now listed as Dynamic Bundles in the Shop. A Dynamic Bundle’s price will be automatically reduced if the player already owns one or more of the items that are part of that Bundle. Two-item Bundles are not dynamic, and players will be unable to purchase a two-item Bundle if they already own one of the items it contains. Check out our recent blog on Dynamic Bundles to learn more about this new feature. The Ability Hotbar has received new art, and is now more visually compact. The Activated Talent Hotbar has received new art, and its buttons are now slightly larger. Hero Status Bars have received additional polish and improvements. The color of allied Health bars has been changed from green to blue. Hero Health bars now more clearly denote 1,000 and 250 Health segments. Shields will now appear white, rather than blue, on Hero Health bars. Damage, damage over time, and quick Healing effects are now much easier to distinguish on Health bars. Players may now select which game server they’d like to play on by selecting it from the Preferred Game Server dropdown on the Language and Region options menu. This setting will default to Best Match, but players may wish to change this if they notice connection issues when playing on a specific server. Please note: As we continue to improve and expand our game sites, Best Match will provide the best play experience for most players. If you are not experiencing issues, it is highly recommend that you leave this set to Best Match. If players in a party have conflicting server preferences, the server that is most commonly selected among the party’s members will be used. Reporting Options have been reworked, and now include categories for Abusive Chat, AFK/Non-Participation, and Intentional Feeding. Hero and Team League are no longer separated in the out-of-game menus, and can now be found using the new Ranked page on the Play screen. All players’ Hero and Team League ranks have been reset with today’s update. Please Note: Matchmaking ratings have not been reset. All players must now play 20 placement matches in order to receive an initial ranking for Hero League or Team League. Read our recent blog on Ranked Play Updates to learn more about Placement Matches. Hero League is now limited to a maximum party size of four players. Five-player parties will now be automatically queued for Team League when attempting to find a Ranked match. The ability to create a named team has been removed, while this feature undergoes additional review. Players who have spent Gold to create named teams in the past will have that amount of Gold returned to them in the days to come. Team League draft lobbies will still use the First Come First Served draft format. Team League will still use a separate matchmaking rating (MMR) from Hero League. However, because Team League parties do not have static rosters, Team League MMR will now functions much like it does for Hero League. This means that each player’s Team League MMR is based on their own individual performance in Team League matches. Read our recent blog on Ranked Play Updates to learn more about Placement Matches, as well as Hero and Team League updates. Please note: Elite A.I. development is not yet complete, and improvements are slated to arrive with a future game update. A.I. teammates will mirror the difficulty selected for A.I. opponents. When playing in a party, only the party leader may change the A.I. difficulty setting. When attempting to find a Versus A.I. game with human allies, the matchmaker will work to find other players who have selected the same A.I. difficulty level. If it takes too long to find a suitable match, the matchmaker will expand its search to include difficulty levels above and below the player’s selection. If the human players on a team had selected a variety of A.I. difficulties, an A.I. opponent of each selected difficulty will be used for that game. For example: If two players selected Adept A.I. and three selected Veteran, the game will be filled with two adept and three veteran A.I. opponents. Developer Comments: This change was aimed at removing odd gameplay where an Abathur player may actually want to sacrifice his Monstrosity or a Gargantuan for a more powerful one. This occurred if players kept summons alive for a very long time and gained several levels, as these levels were not reflected in the Summon’s Ability Power. For short term Summons, players will rarely gain a level or more while that Summon is alive, so we made these snapshot instead. With snapshotting, players can use a temporary power boost, such as Overdrive or Arcane Power, to create a more powerful summon. ​These rules affect Ability Power only. All summons and persistent effects always update with levels. Developer Comments: The Jaina changes are a result of her being too powerful right now, and we have a secondary goal of increasing the play of Ring of Frost. By reducing the impact of summoning a Water Elemental, Jaina loses some of her burst potential unless she chooses Ring of Frost. Water Elemental is now more focused on producing sustained damage. Developer Comments: Overall Raynor’s win rate is low and using Inspire can feel clunky as it resets your Basic Attack period. These changes should help Raynor feel more responsive to play, while also making him a bit more powerful. We also did a pass at shuffling around and tuning up some of his least picked talents. Developer Comments: We looked at tuning up talents that wouldn’t impact his core Spider build. We’ve reverted some of the Ravenous Spirit nerfs as we saw a large shift from Ravenous to Gargantuan and wanted to see a better mix of the two. Developer Comments: Bloodlust is rarely picked right now, but we feel like both Heroics are extremely powerful. Without changing anything massive, we’re simply reducing the CD of Bloodlust so it can be used more frequently. We believe if Basic Attack based heroes become more prevalent in the Meta, this Heroic could become dominant, so we’ll be taking a cautious approach. Developer Comments: Overall, we’re looking to tune Sonya up slightly. With the health increases, she’ll be a bit more tanky. Previously, Whirlwind could be very frustrating to lane against if you didn’t have a stun. With the shift of less healing from minions and more from heroes, this will make Sonya less of a lane bully and more of an effective skirmisher. The Wonder Billie Mount can now be properly selected for use in Hero League and Custom Games. Fixed a rare issue that could sometimes cause matchmade games to start with fewer than 10 players. Fixed an issue that could cause French AZERTY and German QWERTZ keyboards to revert to using QWERTY keyboard hotkeys. Fixed an issue that could cause a noticeable gamma change for some Mac users. The visual effects preceding Furnace Blast’s explosion will now remain visible while The Butcher is affected by Brightwing’s Polymorph. Anub’arak’s Web Wrap and Stitches‘ Gorge will now work properly when used against Unstoppable targets, which is consistent with Zagara’s Devouring Maw. After learning the Wintermute Talent, Jaina’s Water Elemental will now properly mirror her Blizzard casts. Kerrigan’s Aggressive Defense Talent now correctly increases the Assimilation Shield amount gained from Basic Attacks and Abilities by 100% when paired with her Fury of the Swarm Talent. Li Li’s Cloud Serpent will now attack at the proper speed whether Li Li is moving or standing still. Malfurion’s Tranquility will no longer heal him for double the intended amount. Nazeebo’s Gargantuan Stomp tooltip now properly reflects a 5 second Ability cooldown for the Ability. Fixed an issue that could cause the Gargantuan Stomp button to persist on Nazeebo’s Ability Hotbar after his Gargantuan had been killed. Fixed an issue that could prevent Abilities like Brightwing’s Soothing Mist or Malfurion’s Life Seed from auto-casting during Iceblock, or periods during which players are stunned or silenced. Fixed an issue that could cause Stitches’ Hook to become visually stuck to an enemy Hero and fail to pull the target under certain circumstances. Fixed an issue that could occasionally cause Tyrael’s Judgment to fail to cast properly on the intended target. Tyrael’s Judgment will no longer affect Heroes inside Zagara’s Devouring Maw. Casting Zeratul’s Void Prison on Forts or Keeps should no longer cause targeting issues for Blackheart’s cannons. Entering Void Prison while using The Butcher’s Ruthless Onslaught will no longer cause Ruthless Onslaught’s sound effects to loop. Takedown and Death counters in Player Profiles have been updated with totals from all previous patches, and will no longer reset with each Heroes patch. The recipient for an incomplete chat message will no longer switch back to Allies upon re-opening the chat box. Most Takedowns As, Most Deaths As, and Games Played statistics will now update correctly when a Hero in the Top 3 is replaced.